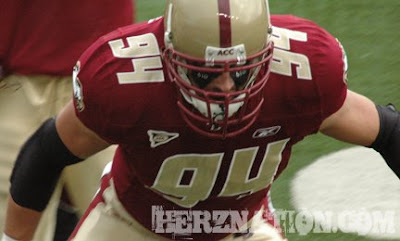 HERZNATION.BLOG » Blog Archive » HERZLICH GOES IN THE 2010 TOP TEN – TOO SOON? HERZLICH GOES IN THE 2010 TOP TEN – TOO SOON? Even before the smoke has cleared from the 2009 NFL Draft the mock 2010 Drafts are out. SI.com has Herzlich going number 7 overall to the Cleveland Browns. Where as CBS has him going number 4 overall. I’ve checked other sites that have him going in the top 40. Let’s be honest, it is too soon. The only time that Herzlich needs to worry about Draft day is the day after the Eagles win the bowl game. That goes for me too. I’ll just report the circus. Congrats to all of the Eagles Free Agents.